The lattice. - Denomination of notes by lettered symbols and additional signs. - Unison vectors. - The use of unison vectors for simplifying notation. - Periodicity blocks. - Complementary scales of twelve semitones. - Complementary scales of twenty-two sruti's. - Scales of nineteen tritotones. - Scales of thirty-one diëses. - Scale of fourty-one supracommas. - Seales of fifty-three commas. - Conversion of vectors into numerical factors - Table of unison vectors, microsons and minisons. Starting from an original pitch level, by adding and subtracting fundamental pitch intervals, an infinite variety of musical notes will be produced. For fundamental intervals I shall take the octave, representing the harmonic frequency ratio 2/1, the perfect fifth with the ratio 3/2, the perfect major third, ratio 5/4, and the concordant perfect seventh, ratio 7/4. The axis of the fifths is from left to right. The axis of the major thirds is in the plane of the paper, from below to above. The axis of the sevenths runs from back to front. Denomination of notes by lettered symbols and additional signs. , , /, \, , , , . In music the usual notation is by simple letters for notes, one fifth apart. Thus we have a correspondence as follows. A column of successive major thirds is written as shown. Care must be taken to avoid an ambiguity, in that not only 0,1,0, one major third above D, bears the name f-sharp, but the fifth 4,0,0 too, one place beyond b (3,0,0) is commonly called f-sharp. The latter, however, is sharper than the former, by one syntonic comma, the fraction 81/80. Therefore it is appropriate for 4,0,0 to use an additional commatic sign, a stroke sloping upward, /, and to name it f-sharp-comma-up, /f . Likewise there is a difference of a syntonic comma between b-flat for 0,-1,0 and b-flat-comma-down, -4,0,0, or \b . Similar discriminations are to be made between \e and e , or between /c and c . Again, discrimination is necessary between \e and e, or c and /c, \f and f. The rule will be that the commatic stroke is added to that homonym of a pair, which in the lattice is farther away from the centre D, reckoned by the number of steps required for coming from D. Because 3 + 2 is more than 1 + 3, therefore /f = (3,2,0) has the commatic sign, and f =(-1,3,0) is without stroke. The concordant perfect sevenths necessitate the adoption of some more additional signs. The seventh above D is a trifle flatter than both c and /c. It is 63/64 flatter than c and 35/36 flatter than /c. We choose the sign invented by Giuseppe Tartini (1752), a hook pointing down, and symbolising something like a half flat, c . We call the note c-half-flat. Again, the seventh of c (-2,0,0) is a trifle flatter than both b-flats (-4,0,0) and (0,-1,0). We call it b-flat-and-half. The name of the seventh of c-half-flat, i.e. the second seventh of D, consequently must be b-flat-and-half-and-half. The subseventh below D is a trifle sharper than both e's. We propose to call it e-half-sharp and to use an additional sign suggesting a sharp with one stroke only, e . The subseventh of e is a trifle sharper than f . It will be called f-sharp-and-half. Consequently the second subseventh of D must bear the name f-sharp-and-half-and-half. Such considerations lead to the following correspondences. Thus there is a row of six sevenths from a-flat-and-half-and-half-and-half to g-sharp-and-half-and-half-and-half. Obviously here the symbols by numbers offer some ease of definition. By the combination of thirds and sevenths curious mixtures of sharps and flats may appear. The note (0,2,0) must be called a-sharp. The seventh (0,2,1) consequently will be g-sharp-half-flat. Another seventh added makes (0,2,2) to be f-sharp-half-flat-and-half, f . One would like to substitute simply f for that. We shall presently return to similar questions after having seen what unison vectors are. All pairs of notes differing by octaves only are considered unisons. There are other pairs of notes which in musical practice are considered to be unisonous. Three major thirds, from the origin 0,0,0 lead to a note 0,3,0. On the ordinary key-instruments this note is taken to be identical with the octave 0,0,0. It should be 125/128 flat. As a rule no attention is paid to the difference of c (-2,0,0) and /c (2,-1,0). But the difference is a syntonic comma, vid. 81/80. Again, twelve consecutive fifths are supposed to lead to a note, seven octaves up. Thus 12,0,0 is taken to be unison with 0,0,0. Yet the difference is 531441/524288, or 74/73 sharp, the pythagorean comma. We incidentally met a-flat-and-half-and-half-and-half, 0,0,3, which practically is unison with g (-1,0,0). The difference is (1,0,3), that is 1029/1024, or 206/205 sharp. Again, there is b-sharp (2,2,0) which most often is identified with c-half-flat (0,0,1), because the difference (2,2,-1) is no more than 225/224 sharp. The vectors, which in the harmonic note lattice connect such notes taken for unisons will be called unison vectors. In the last section quite a number of unison vectors have been tabulated. Given two vectors, accepted as unison vectors, it is obvious that their sum too must be accepted to be a unison vector. Thus, adding (1,0,3) + (2,2,-1), their sum (3,2,2) must be a unison vector too. It represents the residual fraction 108/107. Subtracting (12,0,0) - (4,-1,0) = (8,1,0) makes the well known schisma, with a residual fraction 800/799. Having a unison vector, by successive multiplying one gets a series of unison notes, and thus a periodicity in the harmonic note lattice. Accordingly, having three different unison vectors, by a three-dimensional periodicity, blocks will be formed. The whole lattice will be divided in countless periodicity blocks, each of them representing in a way the whole of the lattice. Obviously there is a considerable economy in handling the finite number of notes within a periodicity block instead of the numberless notes of the complete lattice. Giuseppe Tartini invented already a special sign for contracting one half-flat with a flat, making one flat-and-half, . That is a matter of definition. Accordingly we also contract a half-sharp with a sharp, writing . In practice some unison vectors may be useful to simplify the notation by substituting for the sevenths other notes which require flats and sharps only. (2,2,-1) = 225/224, (1,5,1) = 738/737, and (-7,4,1) = 4375/4374. (1,-3,-2) = 323/322, and (0,-5,2) = 285/284. (1,0,3) = 206/205, and (-7,-1,3) = 268/267. The shifts produced by these substitutions amount to 2/5 comma at most. Here are some examples. As far as these figures go, a fair approximation is shown to take five diëses in a tone, two diëses in a flat or in a sharp, and two commas in a diësis. In a previous paper*) I dealt with the periodicity meshes, formed by unison vectors in the two-dimensional plane lattice of perfect fifths and major thirds. I dwelt on five kinds of selections by various choices of these vectors. For investigating the contents of a periodicity block I project it on a plane of fifths and major thirds, adjusting it in such a way, that the centre of the block lies in one of the notes of the lattice. That note will be chosen as the origin, 0,0,0. It is to become the centre of symmetry, and consequently will be called D. It is not difficult to find the projections of the sections of consecutive planes parallel to the plane of fifths and major thirds, and to see what notes have their projections inside these projected sections. A peculiar puzzle is met in the cases where the periodicity block is to contain an even number of notes. It is quite obvious that an even number of notes cannot have a centre of symmetry. Beside the even number due to the symmetrical pairs, the note in the centre of symmetry will make the total number odd. In the cases of the numbers 12 and 22 we accordingly find that, one note of the block being provisionally taken as a centre of symmetry, there will be other notes, shared by neighbouring blocks. A note in a vertex will be shared by eight blocks, a note in a side face is shared by two blocks. The complete collection with symmetry centre contains unison pairs. By a slight shift of the parallelepiped the sharing is cut off and a choice is made. Thus one gets two complementary scales, which together have a central note of symmetry. In the illustrating diagrams the notes have been represented by cubes. Cubes touching each other represent notes having a perfect interval between them. Where a neighbour is missing, a unison of that neighbour will be found elsewhere in the selection. Thus the interval between these notes will not be quite perfect. There will be a residual fraction, the fraction defined by the unison vector in question. Thus the number of bare squares of the constellation of cubes in question indicates the number of intervals which show a small deviation of the fundamental intervals. Fig. 1. Three-dimensional scale of semitones. Among the 15 notes shown, there are three unison pairs. These have been indicated by similar markings. Fig. 2. Three-dimensional scale of sruti's. Vertices of the periodicity block have been marked by small circles, and the edges of the block are shown. There are unison pairs. Where both partners in such a pair are visible, they have got similar markings. The periodicity block is defined by unison vectors (4,2,0), residual fraction 88/89, (4,-3,2), residual fraction 128/129, and (2,2,-1), residual fraction 225/224. We find a collection of 15 notes, as shown in the diagram. Among them there are two unison pairs, linked up by (4,-3,-2) and one unison pair, linked up by (4,2,0). Accordingly, there are two complementary scales, which together have a centre of symmetry which is not a centre of symmetry of any of the two scales. The notes nr. 6 in the two scales may be interchanged. I do not claim that there is a closer correspondence of these notes with the sruti's of India beyond the number of twenty-two in an octave. The unison vectors chosen are (-1,3,2), fraction 322/323, (7,1,-3), fraction 267/268, and (2,2,-1), fraction 225/224. If the centre of the periodicity block is chosen in a note, D, there are eight unison notes in the vertices, and there are ten unison pairs in two opposite faces of the block. In these pairs the unison ratio is 224/225. Here follow the scales. If we try to make a primary tetrad 4 : 5 : 6 : 7 : 8, we do so with intervals with 7 + 6 + 5 + 4 sruti's, e.g. D : f : a : c : D, then we find that f and a belong to different scales, and instead of c the scales have in common /b , which is 133/132 sharp, 4/5 of a comma. Three variants will be shown. Three periodicity blocks have been formed by combination of the unison vectors here shown, with the implied fractions. Fig. 3. Three scales of 19 tritotones. Two of them lie in a single layer. The notes unison with the centre D have been indicated with dummy cubes. The scales are not complementary. Each scale has a proper centre of symmetry. For comparison's sake they have been tabulated together. Looking at the diagrams, we see that all variants show a considerable number of perfect minor thirds, where two cubes share a common edge. 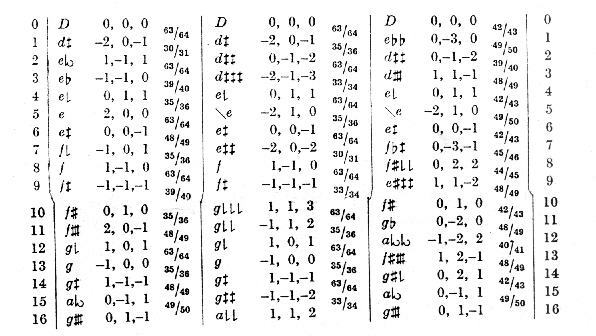 Both the variants H and L have 12 perfect minor thirds, and variant K has even 16 perfect minor thirds. That is why tritotone equal temperament is especially good in minor thirds. Again, we see that variant H shows 19 × 2 + 4 × 5 = 58 bare cube faces. For variant K this number is 19 × 2 + 7 × 2 + 9 × 2 = 70. In the variant L only 8 faces out of a total of 19 × 6 = 114 are shared by neighbouring cubes. Therefore 53 intervals are not perfect representations of the fundamental intervals, in L.
None of the three variants possesses a single perfect seventh. I have taken three variants, from three periodicity blocks, which have been formed by the unison vectors mentioned below with their respective representative fractions. Fig. 4. Three scales of 31 diëses. In scale M the central cube is not visible. In the scales N and P the centres have heen marked with D.
The scales are symmetrical in themselves. Therefore it will be enough to give the notes and intervals from 0 to 16 only. The sixteenth note being the inverse of the fifteenth, the following notes are the symmetrical inverse notes of the preceding ones, and the steps follow in the reverse order. 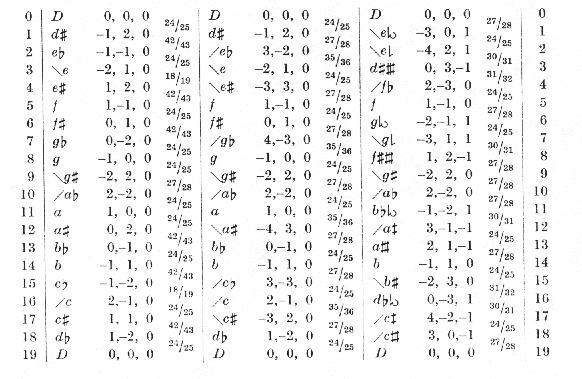 In the scale N (central column) the steps alternate quite regularly between one seventh of a tone (63/64) and one quarter tone (30/31 or 35/36) One were tempted to say: between major and minor diëses, were it not, that the name minor diësis is already in use for 128/125, very near 43/42. In the scale P the steps evenly are all near one-fifth of a tone, between 40/41 and 49/50. In the scale M the steps also range from one quarter tone to one seventh of a tone, but irregularly and with intermediate values. Looking at the diagrams we find that in diagram M we see, from front and from back, 2 × 11 = 22 bare cube faces. That means that we shall find 31 - 11 = 20 perfect sevenths. From left and from right we find 2 × 9 = 18 bare cube faces. Thus there will be 31 - 9 = 22 perfect fifths. From above and from below we see another 2 × 15 = 30 bare cube faces. That means that there are 31 - 15 = 16 perfect major thirds. In the diagram of scale N we see, from front and from back, 2 × 15 = 30 bare faces. There will be found 31 - 15 = 16 perfect sevenths. From left and from right we see 2 × 13 bare faces. There will be 31 - 13 = 18 perfect fifths. From above and from below we see 2 × 25 bare faces. Consequently there will be found 31 - 25 = 6 perfect major thirds only. 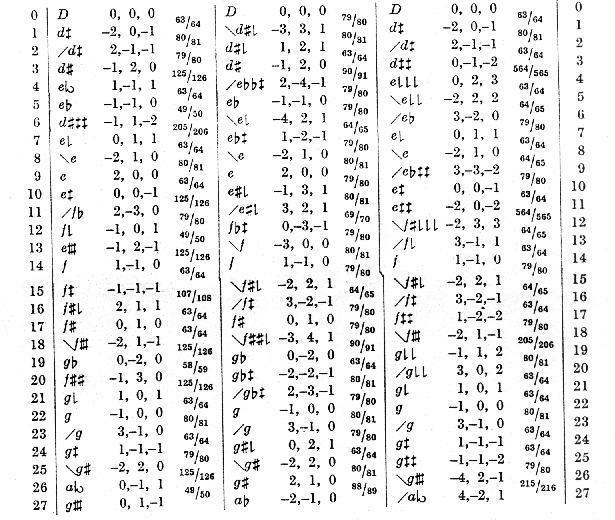 In much the same way we conclude, that in the scale P (the right column) there are 31 - 10 = 21 perfect sevenths, 31 - 27 = 4 perfect fifths only, and 31 - 8 = 23 perfect major thirds. Thus the numbers of available perfect fundamental intervals are 22 fifths, 16 major thirds, 21 perfect sevenths for scale M, 18, 6 and 16 for scale N, and 4, 23, 21 for scale P. The comparison shows that scale M is the best, all round. Scale N has a considerable deficiency of major thirds, and scale P is very poor in perfect fifths. It would take us too far to investigate and to compare the numbers and kinds of concordant triads and tetrads. We take the scale formed by the contents of the periodicity block made by the unison vectors as given here with their defining fractions. The scale is quite symmetrical, numbers n and (41 - n) being inverse one to the other. Here is the scale. Fig. 5. A scale of 41 supracommas in a periodicity block in the three-dimensional harmonic note lattice. The central cube has been marked D.
Very often commas 80/81 alternate with steps twice as large, 41/42, or nearly so (49/50). Two steps are only 125/126, hardly a bit larger than one of the unison vectors constituting the periodicity block (128/129), about 5/8 of a comma. On inspection of the diagram, and counting the bare faces of cubes, where no perfect intervals are available in the scale, we find that in this scale there are 41 - 11 = 30 perfect fifths, 41 - 31 = 10 perfect major thirds, and 41 - 35 = 6 perfect sevenths only. We shall avail ourselves of three sets of unison vectors. Fig. 6. Three scales of 53 commas located in the lattice. The central note of scale Q is not visible. In scales R and S they have been marked D.
For reasons of space economy, I shall give half the scales only. They are symmetrical. The notes nrs. n and (53 - n) are inverse one to the other, and the steps are the same in the two halves, following in reverse order. Here are the notes from 0 to 27 inclusive. The scale R shows a rather uniform distribution of the notes over the octave, The majority of the steps, 34 out of 53, measure <= 1 in 80. The smallest step is 1 in 90 (0.9 comma), the biggest is 1 in 64 (1.25 comma). The scale Q has a much wider variety of steps. Not only do we find two steps of 107/108 (0.75 comma) but 12 steps 125/126 (0.64 comma) and even two steps of 205/206 (2/5 comma). To make good for these losses, we find bigger steps, as big as 49/50 (8/5 comma). The variant S has the most licentious scale. Four of the steps, 564/565 may even be considered as unison. Again, three other steps are of the order of 2/5 of a comma. There is no step bigger than 63/64 (5/4 comma). To make up for the losses owing to the unison intervals, the number of supracommas (63/64 and 64/65) amounts to 30. This variant could be taken as a scale of 53 - 4 - 3 = 46 notes, because of the nearly unison steps. The scores of the totality of perfect intervals are 98 for Q, 80 for R, and 44 for S.
In the course of the investigation time and again we wanted to know the numerical fraction value of intervals, expressed by an interval vector. These will be found in the table below. 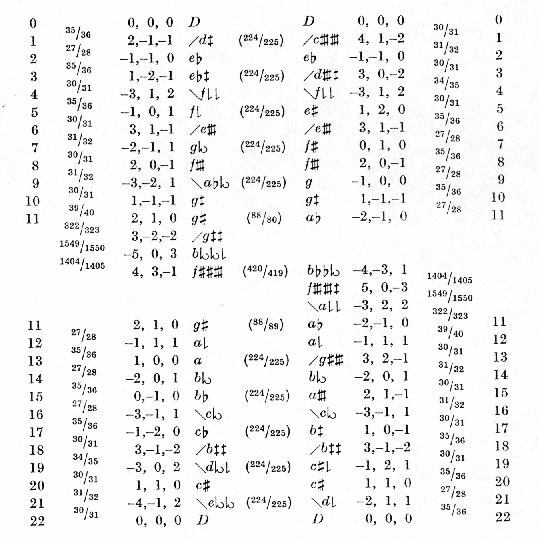 The greater part of the figures given have been taken from the Just Intonation Tables, made by mr John Chalmers, Ph. D., by means of a computer in 1966, and kindly put at my disposal. My thanks are due to him for this very valuable tool in numerical work. *) Proceedings Kon. Nederl. Akad. v. Wetensch., Series B 71, 251, 1968.